1489. flowers given with a "Happy Birfday, Mama!" Ever since Elijah was born, I've had a whole new appreciation for my mother. Before then, it was so easy to take for granted the sacrifices she made and the ways she cared for me. I remember on Elijah's first birthday, someone wished me a “Happy Birth Day” and pointed out that the MOMS are the ones who should be celebrated on a child's birthday—after all, they're the ones who did all the work! After birthing two babies, I couldn't agree more. My mom was the hero on March 18 twenty-nine years ago! So as friends and family celebrate me today, I am throwing out a Birth Day salute to Mom. 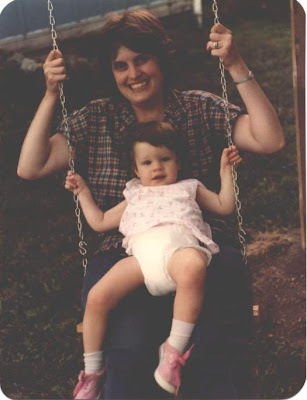 “Thanks” hardly seems adequate—but I am indeed thankful for the mother who was “born” today! I know, I know--who needs another blog to keep up with, right? My feed reader is overflowing...in spite of the fact that ever since Jude was born, I've been doing much less blog-reading and have abandoned attempts to keep up with a lot of blogs, even ones that are really interesting to me. It's just not possible to read everything I'd like to read, much to my dismay. But I've run across a couple of sites recently that are worth sharing. One is brand-new, the other merely new-to-me. Both have some content that has been especially timely for me to read this week. Does Venting Make Moms Feel Better? I think I'll be adding Francis's upcoming book, The Happiest Mom: 10 Secrets to Enjoying Motherhood, to my wishlist, too. We looked for a copycat recipe after falling in love with the famous appetizers at P.F. Chang's--and we think this one is pretty dead on! I'm sure if you had theirs and then ours, you'd totally be able to tell the difference, but if you haven't been there in a while, ours satisfy the craving. The recipe requires the purchase of a couple of special ingredients, which is why I didn't make it for quite a while after I found it--but they are things that last forever and definitely worth it. These wraps are also really labor-intensive with all that mincing (and trying to peel whole leaves of lettuce off the head is a giant pain), so we don't have them very often, but they definitely hit the spot for us recently. FYI, I couldn't find "garlic and red chile paste" - I found "red chili paste" in the international aisle at Kroger and then used a clove of minced garlic. Also, you'll want to cut the special sauce recipe in half, unless you have some other use for it. Sounds weird. Does not look particularly appealing (mine did not look like her pictures). But it was from one of my favorite food blogs, Smitten Kitchen--Deb is a fabulous writer and photographer as well as cook--and I was intrigued. When I ladled it into bowls I was skeptical...when I took my first bite I was excited. Her description is quite apt: "This soup is loud. Beefy, spicy, smoky, textured and complex, ten times better than I even knew pumpkin soup could be." Yes. I'll make this again. This is my friend Marjorie's go-to meal for new moms. She brought it to us in November (along with some whole wheat rolls that were to DIE for...I threw five of them in my freezer and am saving them for a special occasion, oh yum...and these cookies which I ate far too many of). Anyway, Marjorie and her husband have SKILLS in the kitchen and this soup was so wonderful. It has a really distinctive taste, different from all the other tomato-based soups I make. I tried my hand at it a couple of weeks ago, and while it wasn't quite as good as hers (maybe because she uses homemade stock and sausage, maybe because I didn't have to make it, maybe a little of both) it was still quite satisfying. Another Smitten Kitchen recipe I printed off forever ago and just finally got around to trying. I always end up with heavy cream leftover when I make fettuccine alfredo, and these biscuits seemed like a perfect way to use it up (it was exactly the right amount). Healthy they are not...heavy cream is the *only* liquid in the biscuits...but oh my. Just make them. And freeze half before baking them or you'll just eat them all. We've still got food in our freezer because of how nuts I went last summer/fall before Jude was born, but now that we're settling into life with two kiddos I'm enjoying being back in the kitchen some. "Whoever enjoys any worldly pleasure without benediction commits a theft against God." Not too long after my water broke, Cindy checked heart tones again—and Jude's heart rate was way too slow. I could tell it didn't sound right, and there was definitely a note of concern/disturbance in her voice as she called out, “90s...80s..” Normal is 120-160 beats per minute. It's typical for the heart rate to drop as the baby is squeezed through the pelvis, I found out later, but it should only drop into the 90s-110s. Jude's got down into the 70s. Nobody freaked out--Susie especially was so calm and controlled--but she told me that he wasn't tolerating that position well and I needed to move. I shifted onto my back, but his heart rate still didn't come back up. They put an oxygen mask on me and really urged me to push harder. Looking back, it is such a miraculous sign of God's mercy that I was not panicked and fearful at that point. But I wasn't. The pain was unbearable, but I wasn't scared about whether Jude was okay--I had such peace. It felt like I pushed forever; I don't know how long it really was. Then finally, at 11:58 AM, he was born! Susie placed him in my arms, and we waited for him to pink up. She had warned me that it sometimes takes longer with waterbirths, and it really did. He not only didn't cry; he didn't move at all. His eyes were closed and he was completely still. And I didn't really notice at the time, but looking at the pictures, he was just absolutely gray. They put an oxygen mask on him and worked to get him breathing while I held him. And again, I did not feel worried or scared—I felt such inexplicable peace. After just a few moments he started breathing, and cried, and I just wept. I experienced that joy, that love—Thank You, Jesus! Steve held me close and rejoiced over our beautiful son, expressed how proud he was of me. Through tears, I announced that his name was Jude and briefly told why. I was just overcome by the faithfulness of God. It was SO great to be in our own home, to curl up in our own bed...I underestimated how nice that would be. My parents didn't come until the next day, so we were on our own that first night. Steve was better than any nurse :) The way he cared for me so tenderly...having his babies makes me fall in love with him all over again. So...that's the story of Jude's birth. If you made it this far--thanks for reading. I guess you know by now I can't tell a short story :) An amazing display of God's mercy and grace...more answers to prayer than I can count. An occasion for PRAISE, to be sure. God has been so good, so faithful to me. Unlike Elijah's birth, this time my contractions never were super close together--in fact, Susie was encouraging me to go for a walk to get them going more frequently. I paced through the house a bit, but mostly I just wanted to be leaning over. And though the contractions weren't coming fast, they were long, and strong. But WOW--having a break between them made all the difference in the world! I was so much more able to cope! Then between 10:30-11, Susie told me they had another client in labor. After some discussion, it was like my body decided, “You better get serious or you're going to lose your midwife!” I said I wanted to get in the tub, NOW. And the water felt SOOOO good—I wished I had gotten in sooner! I'd been afraid to get in too early because I had heard that if you do, it could actually slow things down—and I guess since my contractions weren't super close together, I was extra cautious about stalling labor. Anyway, I leaned over the side of the tub and just LOVED how good it felt. I was feeling more and more pushy, and more anxious about the pain. During one contraction, Dee read the lyrics of “Begone, Unbelief”--I could hardly hear or understand her over my own groans, but still it was a comfort. And my noises were *much* more controlled this time; no screaming hysterically like I'd done the last time. It felt best to me to be on my knees, leaning over the side of the tub. Soon my water broke, and the pain got really intense. Plus my legs kept cramping, which was so horrible! But the best part was that I never felt alone. The pain was still scary, but I felt so much more supported. I'd grip Steve's and Dee's hands. I kept needing to make eye contact with someone—usually Dee or Susie—to avoid losing it. Toward the end, Steve was praying continually, right close to my ear. His calm, low, steady voice was so comforting and helped keep me grounded.